I noticed on Friday that Rovers sneaked in a ‘double edition’ with the Finn Harps game tomorrow night also featuring ! That's entirely fair I would have thought? Do other clubs not do the same when there's two home games on the same weekend? Can’t speak for other clubs but Dundalk always produce a programme for each match. we never do any more. years back we used to produce a programme for each match but that was in 2000/01 season which is different circumstances to nowadays! We do one for each match, even league cup games. It's a difficult one though, it inevitably means the second has to be written before the first game, and that weekend's underage games, so putting it together is a challenge. Before any millionaires came near us the programme produced was excellent and always one for each game. Thats truly going above and beyond lol. Have to echo the lads above, we were in the 1st Division too when the programme we have today started to be produced. It took some amount of effort to get 2 editions done for 2 fixtures in one week. Iirc once there was a double edition but that had to do with the printers not being able to meet the deadlines. The numbers printed for match nights have obviously changed with a run of say 500 through to now where it would be about 4k+. There was a spell when it was looked at by a prior boardmembers as unnecessary cost, it was tweaked from all colour to a mix. The quality of content and cheap price meant it was grew to be in demand. Again I vaguely remember that it was a Dundalk FC magazine as well as a match programme which could have been available in newsagents locally. With the improvement in quality matchnight sales were solid and minimised any cost to club coffers as empty as they were at one time. I still think it was a good idea to have a magazine version that could be stocked and relevant bar just for matchnight. Probably that's just a step too far for the level of effort needed by the volunteers and contributers. Maybe I have the details askew as it mid 2000s that it was launched. There are contributors on here that might be clearer on those days. There was talk of turning the programme into a club magazine and trying to get it into newsagents etc, but as far as I recall it never happened. Print runs are nothing like you suggest Nesta, I'm not sure of exact numbers these days but we would have budgeted for selling to about 20-25% of the crowd, so we used to print about 300 in the First Division, probably not much more than 500 these days. Wonder would there be a market for a club magazine ? A few attempts at LOI mags have bitten the dust over the year's and that not factoring in the decline of printed materials generally (due to online options). I remember hearing how they calculated numbers of programs to print at Croke Park and it was something like 20% of estimated crowd expected for the stands and 10% for Hill 16 (on the basis that Dublin fans knew their own players and didn't care who the opposition was ). Wonder how LOI clubs estimate number of progs to print or is there a set print run irrespective of opponent ? I was involved in the DFC programme around mid 00’s and I suggested the name change to ‘magazine’ with the idea of having non match day only articles, in an attempt to have it available as a kind of combo match prog / magazine, as at that time the size of the ‘programme’ was about 2/3 the size of a magazine, in size not content. It never got off the ground, as it was always going to be difficult for non match nights for places to stock it, and logistics to get it there, but it was an idea ! The furthest it got was the ‘programme’ changed its name around that time to ‘Dundalk FC Magazine’ this retained up to this day, however from last season the title move to the second page where its still listed. I`m not involved these days, but I did a lot of articles following my year involved, and I know how hard a job it can be for anyone working on a publication, not just for Dundalk, for all clubs. Interesting information on how producers go about estimating demand at Croke Part (GAA) games. I would say it is a good rule of thumb for LoI clubs as well but maybe use a lower % figure. 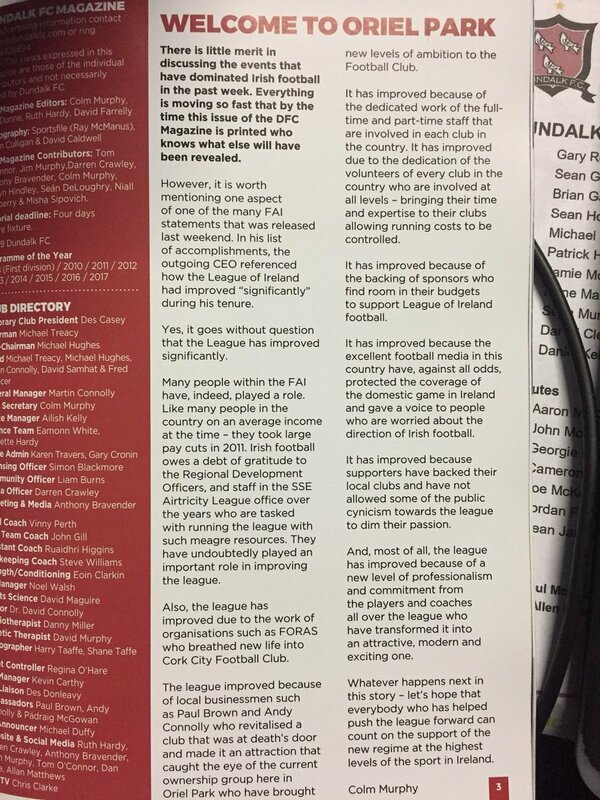 Slight difference to LoI programmes would be that the contributors get paid. Apart from Stephen Kenny, I doubt if many other get paid for their articles. Eamon Dunphy used to back in the Milltown days. It was also a nice way of topping up players/managers wages over in England years ago as well. Question for those involved, what % of production costs would you hope/expect to cover by advertisements? Big debate going on in the GAA these days regarding the amount of money given to Dublin in comparison to other counties. The Croke Park officials(Those who run the organisation) defend this on the basis that the Dubs bring in the money, but others point out that away crowds at Dublin games are fairly modest and it seems that the average Dub fan spends less in Croker than the rest of us. With regard to the Blues programme, when we were in the first division it was pretty much 0%. Costs then were (just about) covered by sales, which were usually fairly steady and predictable at around the 20-25% of attendance as seand mentioned above. We ordered about 1 in 4 of expected attendance usually, and if they didn't all sell on the night at least some of the remainder would go, over time, to collectors browsing in the club shop. And the printers were the only contributors who got paid for anything! Really???! I'm going to have to have words with someone for cooking the books so to speak. As an aside a PDF of the programme is made available for distribution to exiled supporters on the eveing of/day after a game. Pick up the match programme regardless of where CCFC play, or who they are playing. I think I would be visibly upset if I failed to get one on match night. Completely addicted to them! I am missing about 20 programmes (all away) since 1984, some of which may have had no issue at all. It's part of the match night experience for me and I would know most of the (fairly serious) collectors around the country. We'd have a wee network built up over many years for helping each other out. Quite the statement from Colm Murphy in the DFC match programme last night. Bualadh bos agus well said. Fair play to him, and the editor for allowing it in. Wisely doesn't tackle the central matter directly too much.. because that could backfire on a club big-time. Colm Murphy is Editor and also the Club Secretary.